I have mentioned before how I am LOVIN' Greek Yogurt right now as post-workout snacks and I have also recently gotten into the routine of having cereal every morning. (I used to HATE cereal!). So what better combination than the new Honey Bunches of Oats Greek Honey Crunch! I am a huge fan and so is my hubby! It has been his preferred cereal every morning! With the one-of-a-kind unmistakable crunch of the traditional Post® Honey Bunches of Oats cereals, new Honey Bunches of Oats Greek Honey Crunch also mixes in the perfect combination of crispy whole grain flakes and two tasty, crunchy granola clusters made with real Greek yogurt. The original recipe of flakes and granola oat clusters, sweetened with just a touch of honey, was created in 1986. Long-time Post Foods employee Vernon J. Herzing and his daughter, Kimberly, mixed together different Post cereals, creating what would later become Honey Bunches of Oats Honey Roasted. Today, Honey Bunches of Oats is one of the top-selling cereals in America, and 50 million smiles can’t be wrong! New Honey Bunches of Oats Greek is made with two unique granolas made with Greek yogurt, crispy whole grain flakes and a touch of honey. With 33 grams of Whole Grains, one bowl provides over two-thirds of your day's Whole Grains. Nutritionists recommend eating three or more servings of whole grain foods per day (about 16g whole grain per serving or at least 48g per day) so Honey Bunches of Oats Greek is a great source and perfect choice for breakfast! 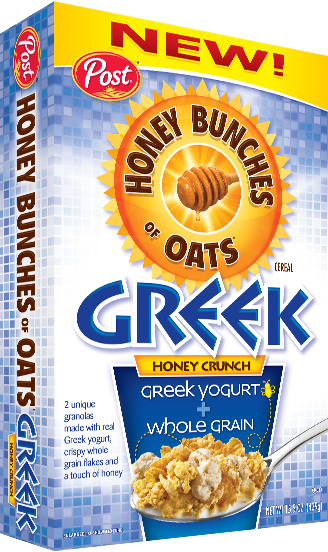 So look forward to breakfast every morning with the Honey Bunches of Oats Greek! It makes it easy for the entire family to Rise and Smile! 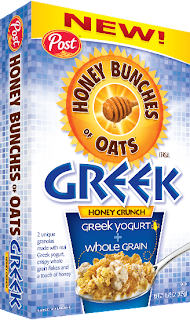 Buy It: You can purchase Honey Bunches of Oats Greek Honey Crunch from your local retailer!